The haunted prison in Moundsville, West Virginia is said to be one of the spookiest places in all of the area. This particular prison has been listed on the top ten list of the Department of Justice’s as one of the “most violent”. Established in the year of 1866, this facility imprisoned one hundred and nineteen years worth of inmates. Hauntings were reported as early as the 1930’s. In this particular instance, guards that kept an eye out for possible escapees would see an inmate walking along the grounds, near the area that was considered to be “Maintenance”. When these guards set off the alarms and investigated the area more closely, it was determined that there was no living inmate outside the structure. It was during this time that this haunted prison became reputed for having spirits. Thousands of individuals have been housed at this haunted prison during their lifetime. According to the Travel Channel’s “Ghost Adventures”, it is estimated that nearly one thousand of these individuals passed away while being incarcerated at the facility. To the individuals who have worked at this structure, those that have researched it, and those that have simply visited the haunted prison, it is believed most, if not all, of the deceased’s spirits linger in and around this immensely ominous structure in West Virginia. It is not unusual for someone to personally witness an intimidating apparition, hear a frightening noise, feel as if they are being watched, or for someone to feel as if they are being followed. Legend tells us that when the Moundsville Prison was constructed, the land that it was built upon once belonged to a group of Native Americans. The Native Americans had constructed a unique burial ground to honor their dead on the land. When ground was broke to start the construction on the Moundsville Prison, the construction crew actually built the facility on top of the sacred burial ground. It is believed that the negative energy emerged from the deceased Native Americans infiltrated the prison, resulting in many paranormal and unusual events that occurred there. The ground had been blessed for those buried there, but an ancient curse was left upon the land to those that disrupted the rest of the Native Americans. Many notable individuals have been housed at or associated with this haunted prison. One of which was Charles Manson. This individual has been considered to be one of the most dangerous minded occult leaders in all of American history. In the 1960’s, he had such influence over the people in his particular coven that he actually encouraged and convinced them to commit the various murders that were considered to be “Helter Skelter”. At one point in his life, Charles Manson wrote a letter requesting to be transferred to the haunted prison. It is believed that he made this request because of the fact that he had relatives, friends, and fellow occultists that resided close to the facility. While his request was denied, the hand-written letter can be seen on display while touring the prison. The “Sugar Shack” was a room that was created for the purpose of recreation for the inmates when outside weather conditions would not permit them to go outdoors. This room was in the basement area of the immense structure. Today, many investigations lead to paranormal discoveries in this particular area. Sometimes, witnesses can hear people arguing and talking, while other times, only distant whispers can be heard. Many unexplained noises and cold spots can also be felt in this particular area. The Moundsville Prison in West Virginia is considered to be one of the most haunted prisons in all of the United States today. If you enjoy ghost hunting, and love visiting places full of historical events, this haunted prison is sure to be one of the most exciting experiences you will ever have! If you visit this prison maybe you'll be the next one with a story to tell! 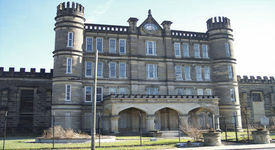 Click here to read what one of our visitors experienced at Moundsville Prison. This is a great short documentary video of the hauntings in the prison.